The rebuilding of the west front of Lichfield Cathedral was began shortly after 1285. The central doorway is richly decorated and features sculpted figures on the central pillar and sides of the porch. The west front remained unaltered and escaped damage during the Reformation of the 16th century. Many of the statues were damaged during the 17th century parliamentarian siege and occupation with a large number of medieval statues being removed during the mid 18th century. The sculpted figures which remain in the porch are the work of the 19th century British sculptor Mary Grant. 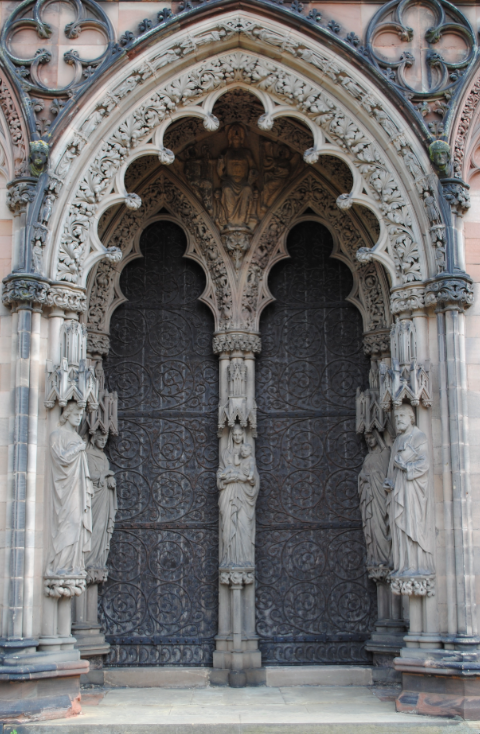 The statues date to the time of the Victorian restoration work of George Gilbert Scott with figures of Moses and Aaron on either side of the doorway. The central pillar has the figure of the Virgin Mary holding Jesus with the figure of St Mary Magdalene on the left.